ESP have been installing domestic security systems for twenty years. 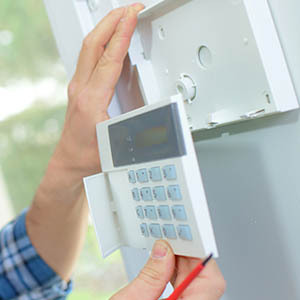 When purchasing an alarm system for your property, It is very important who you use to install the system, but it is equally important which alarm panel you choose to install. In almost every installation ESP install the HKC 10/70 Securewatch System. When other manufactures ask why we only install the HKC Panel, we tell them it is because it is the most user friendly and reliable system on the market with the best technical support . Along with the alarm panel, we usually install a vibration sensor on each window and door and a motion beam positioned usually in the hallway or a central area. These two detectors work very well together. The first one detecting an entry through the window or door and alerting the monitoring station and then the motion beam sending a second message thus confirming the intruder is now in the home. Although most of our alarm systems are installed in the greater Dublin area, we are just as happy to install systems in Meath, Kildare, Wicklow and Louth. When we install a home alarm security system, we always use a panel which is both wired and wireless. The reason for this is simple – if during installation we discover a broken cable in a pre-wired home,we won’t need to damage walls to repair the damaged cable. Instead we use a wire free sensor. It also makes it easier to extend the alarm system in the future if required. When replacing sensors on your windows we will always endeavour to reinstall the new sensors in the same position as the old sensor to avoid leaving marks on the window frame and we will always ask the customer for the colour of the window frames so we can best match the sensors. However with our modern domestic alarm systems, there will be very little drilling in your home or cleaning up for that matter as our engineers will always leave your home as they found it.